Clearly I have a thing for prints this week, if you couldn’t already tell from today’s post. Another print I’m eager to buy is this super cute Rebecca Taylor sweatshirt – love the color combo and zipper detail! This Kenzo dress is another obsession. I know it’s been up for a while, but have you checked out NET-A-PORTER’s beauty department? They’ve been adding tons of new brands to the lineup that are definitely worth the splurge. I’m dying to try out this thickening spray and getting this pack for Christmas certainly wouldn’t be a negative. Last but not least, I’ll be heading to NYFW from Sunday to Tuesday next week so I’m already starting to pack (or at the very least have planned my outfits). Looking forward to a couple of very exciting meetings and a few parties won’t hurt either. That leopard coat is all sorts of amazing. I love all the patterns, and that Givenchy clutch is absolutely beautiful. Great picks! That leopard bag is just to die for!! That leopard bag is incredible! Ummm I need those Oscar de la Renta shorts! So amazing. Great find, Merritt! god that Givency clutch is FANTASTIC. I need it. Such classy items! I love them all, especially the prints and color. The shape of that dress is so great! Love everything on this list! That Givenchy clutch is just gorgeous! Great edit! Love the Givenchy clutch and red + blue dress! I love all the prints you featured! Leopard is a forever favorite, but I’m starting to get really into Houndstooth, too! You can imagine how pumped I am about the Net-A-Porter beauty department! Aren’t their curated brands the BOMB? Can’t wait to see you this weekend! what a fabulous wish list. I can easily say I’d take it all! Especially that leopard bag, the printed shorts, and the gold and blue bracelet. 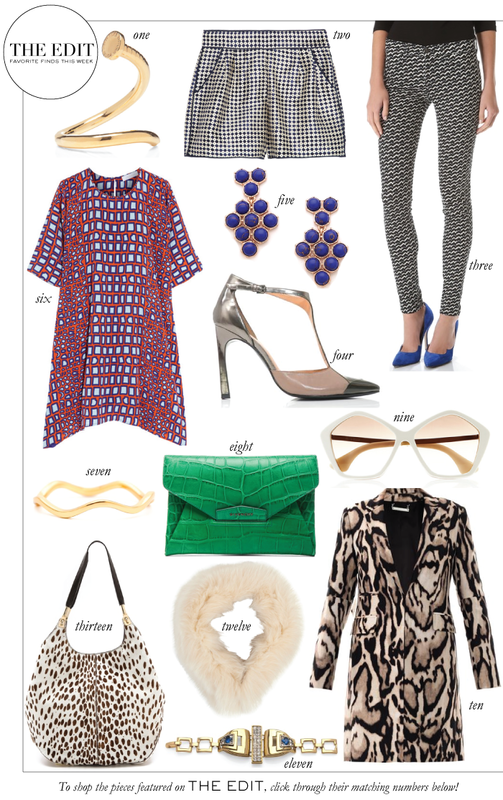 Isn’t that Diane von Furstenberg print AMAZING? I love the pants too! The printed bag is amazing! The perfect colors and textures for fall!